2016 will be an exciting time for Inniscarra GAA club with the redevelopment of the ''Box Pitch'' commencing. We will be installing Purpose Designed Floodlighting to allow our Juvenile & Adult teams extend their training seasons and allow our teams train under Floodlit conditions in preparation for Championship & League deciders, now held at the later stages of the calendar year with many of the games under floodlighting. It will also see the erection of Permanent Goalposts & Ball Stop netting along with Ground development works. This re-development will expand our training times capacity, notably midweek. Given the expansion of our membership, which has resulted in some age groups now entering two separate teams, our existing facilities are under huge time pressures. Under-Age teams now play more frequently in comparison to even 5 years ago and the ability to train under floodlit conditions will assist these age groups in continuing to compete at the highest levels. 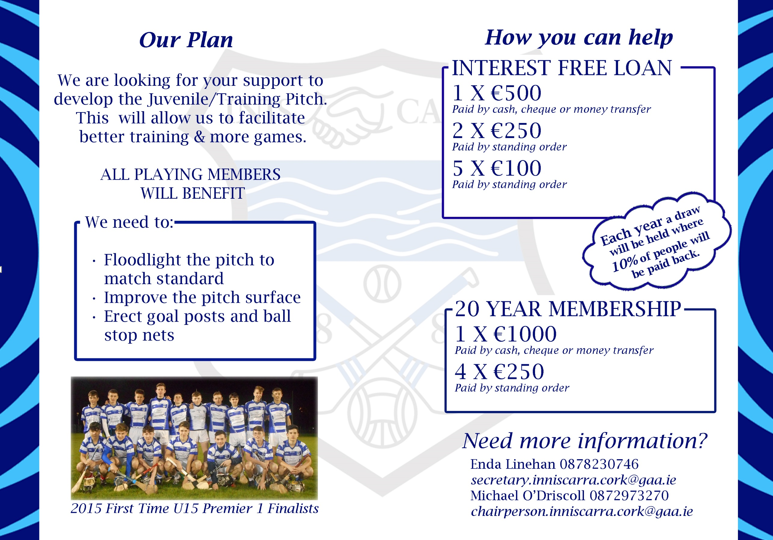 To help raise funds for this development, the club is offering 20 year membership for â¬1000.